Persian carpets have been among the world’s most desired luxury items for centuries. It has adorned palaces, mansions, business, houses and even small apartments. It inspired painters and artisans alike. Its appeal is its beauty, its design and its longevity. All these elements make it a very valuable asset to have. What is maybe less known is that it is also a 100% organic, handmade product. The processes involved in the making of a Persian carpet is many and varied and it starts with rearing a herd of sheep. Persian carpets are predominantly made from sheep wool, cotton and some with silk. The start of a Persian carpet is getting the raw material that will be used in making the carpet. In city weaving centers the wool merchants have many different types of wool available, whereas tribal weavers (especially nomadic ones) still need to sheer the sheep and then comb, wash and spin the wool into usable threads. The same goes for the silk and cotton that is used in carpets. In rural weaving areas the wool is dyed with dyes made from plants and insects, hence the term vegetable dyes. The wool threads are placed in a pot with boiling water and dye and boiled until the desired colour is obtained, after which it is hung up to dry. In the city weaving centers experienced dyers dye wool in advance in all different colours and shades ready for the weavers to purchase. In rural areas a loom has to be built first (unless the carpet is woven loom-less and horizontally) with cotton warps. Nomadic weavers especially do not have the capacity to travel with looms so they opt to make one as needed. In city weaving centers looms for different size carpets are more permanent structures and only the cotton warps need replacing after each carpet is woven. The designs used in tribal carpets come from the weaver’s memory as taught by his/her parents and grandparents. It is mostly items from everyday life and protective symbols. In city weaving centers carpet designers create designs that are then used by weavers. These designs are called the carpet map and is drawn onto a paper with blocks, each representing 1 knot in the carpet. This allows the weaver to know the colour of each knot. Carpet maps can also be woven miniature examples or a quarter part of the bigger carpet that will be replicated to form a complete carpet. In rural areas the weaver is left to his own devices to work out the colour of each knot based on the design in his memory whereas city weavers have a “map reader” that reads each knot’s colour per row as the weaver weaves. In previous decades the map reader was a person and this was developed into an art form because map readers would change their “map reading” into a song to ensure that the weavers stay alert and entertained. Nowadays electronic map readers are used more widely instructing the weaver on the colour of each knot. Knowing which cotton, silk or wool to use, knowing which colour dye would produce which colour result over time, knowing how to make a knot, knowing how loose or tight to weave each knot, knowing how to listen to the map reader, knowing how to weave a design, knowing how to start and finish a carpet…all these skills and more are present in each weaver. Most of them learned by observing their parents and grandparents. It takes years to become a master weaver who can produce a fine silk carpet or a fine wool carpet. Most weavers weave non-stop for 6 hours a day. The perseverance it takes to weave a carpet day after day for months and sometime years is probably their most extraordinary skill. Some carpets are so large that it requires many weavers to weave it at the same time to finish it sooner, so not only do they need to know all the skills but they also have to learn to weave in unison making each knot as similar as they possibly can. After the carpet is finished it is cut off the loom and in cities a trimming machine is used to shave the pile so that it is even and level. In tribal weaving a scissor is used to achieve this. After the carpet is trimmed is given to carpet cleaners to wash and dry to ensure that the colour and dye is set. In tribal weaving the weaver will perform this him-/herself. 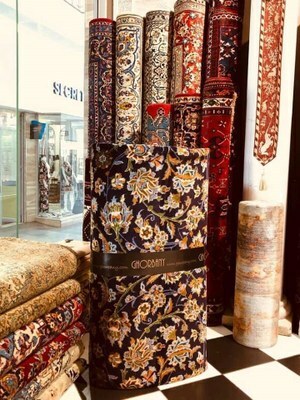 All carpets woven in Iran is gathered in various carpet markets in all major cities. From here carpet dealers will come to select pieces that they want to sell locally or internationally. The carpet dealers now have the task to sell each of the woven pieces to interested customers, telling them the process of weaving or stories about the weaver or tribe that wove it and any other interesting fact that relates to the piece. It is the carpet dealer who ultimately must determine the price of each carpet and this is no task to take lightly, for with each carpet he must consider the fineness, quality of wool, intricacy or rarity in design, the colouring, the size, the weaver or tribe who wove it. All this information must be considered because each person involved in the process of making this carpet makes a living from it, each of them an experienced artisan in his own right, and it is the carpet dealer who must ensure that their efforts get rewarded.